Before starting a AR hot mop shower pan, we first need to check that it has the proper shower drain and that all blocking is done correctly. We then start by covering any areas around the shower pan so we can get a clean hot mop job. Next we add the pre-slope, remove the top flange and adding cold tar to make a sandwich effect, giving it a watertight seal ending. The hot mop consists of 3 layers of felt 15 paper, which has to sit between the two drain flanges. 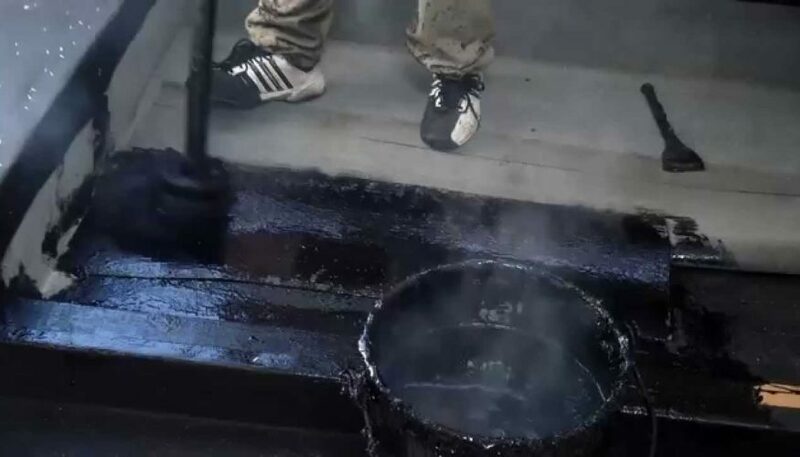 We do add liquid asphalt before, in between, and after every layer of felt paper. By doing this process, we make sure that every corner is tight, and as squared as possible to make it easier for the tile man to install hardy backer after the shower pan is complete. After the three layers of felt paper are ready, we add the yellow fiberglass mesh to every corner and seems. This allows it to strengthen, forbidding it from breaking from all the movement and traffic of the construction. After this process is done, we put the top flange back together, making the sandwich effect a watertight seal. We then tighten the flange back together, and give the shower pan its last coat, mopping over the entire shower making sure not to cover the weep holes of the drain. By not covering the weep holes it allows any water that reaches the hot mop find its way out to the drain line. The final product is now done, all our work is 100% guaranteed to hold water and pass any city inspection. The shower pan drain must be a two piece drain with a removable flange. The reason for the two piece drain is that we take the top flange off and put it back together at the end, this allows it to tighten and gives it a water tight seal. Below are some examples of some preferred and common drains used for hot moping shower pans.